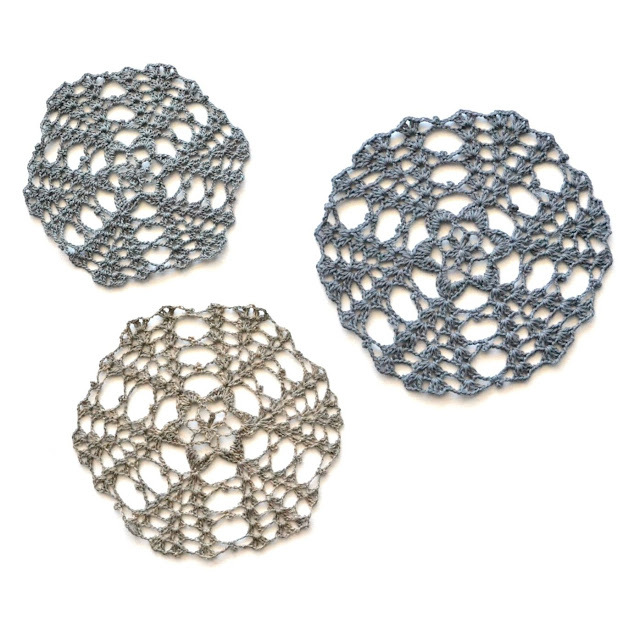 It is so interesting to explore all of the possibilities a stitch pattern or a motif may offer: how it can be worked in rows or in the round, how increases and decreases can be made, what shapes can be created and so on. 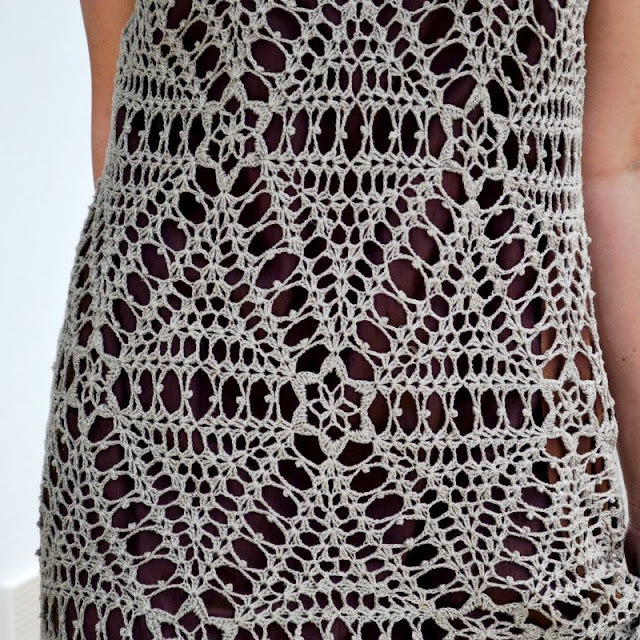 Using the same stitch pattern or motif again doesn't bother me. It is like meeting your good old friend. You've known them for so many years, but there is always something new for you to learn about them and get closer. 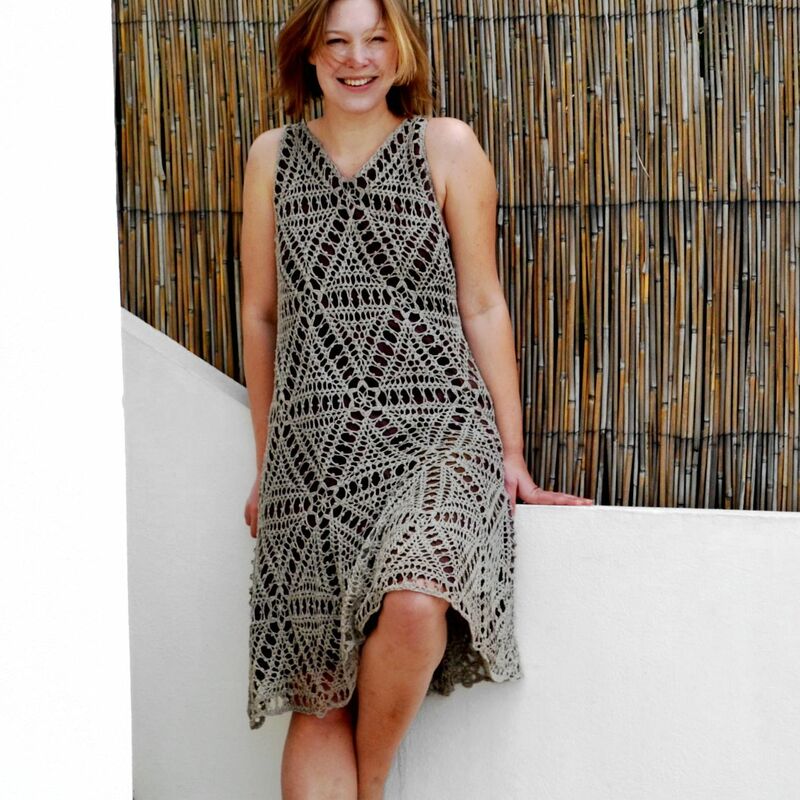 Mavka Dress was started in summer 2015, right after the release of the Banana Pie pattern. I knew the top could be turned into a gorgeous dress, but I did not know then how gorgeous it could be! Clear lines, a gradually expanding silhouette and a flared skirt made this dress both playful and feminine, as well as practical. I hate sewing, nor am I good at it, but I decided that this dress deserved its own fabric lining. I cut two pieces following the dress lines, sewed the top of the dress to the lining, so the neckline and the armhole lines connected directly to the fabric, and let the bottom of the fabric hang free. I wasn't sure what color the fabric should be, so I first tried the dress against a few samples of different colors. Soft matching colors did not do much for the stitch pattern, while darker shades made the yarn color pop. The dress layout uses eight motif types. Some of them are worked in the round (pentagon, hexagon and heptagon), and some are worked sideways and help shape the neckline, the armholes and the bottom of the dress. superrrrrrr ! very nice dress!